The 7-inch wide color touchscreen and convenient keypad combined with on-screen instructions makes the BC380 easy for anyone to operate. 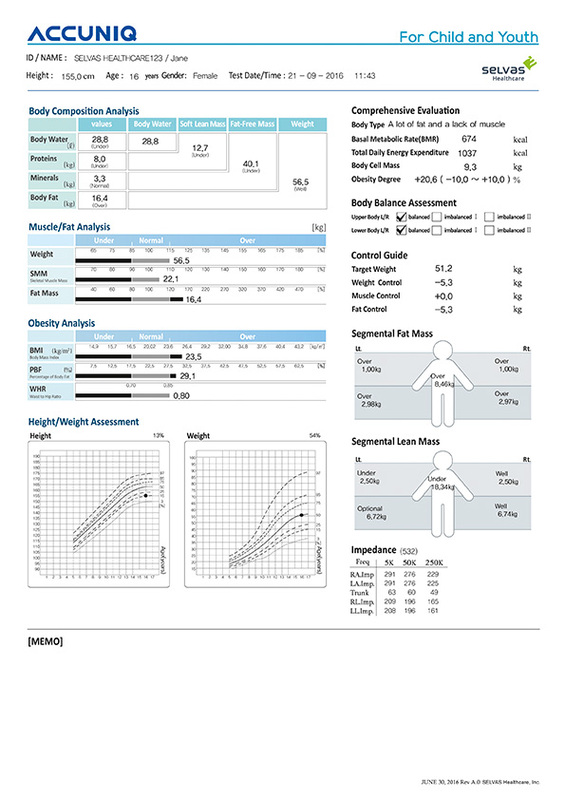 Results are printed in easy to understand format with measurement comparison to the healthy range, making analysis fast and concise. Ultrasonic Height MeterThe ultrasonic height meter increases precision and automatically inputs height. Fully automatic Blood Pressure MonitorYou can diagnose obesity and measure blood pressure simultaneously by connecting a blood pressure monitor to ACCUNIQ BC380. Thermal printerThermal printer for fast printed results. 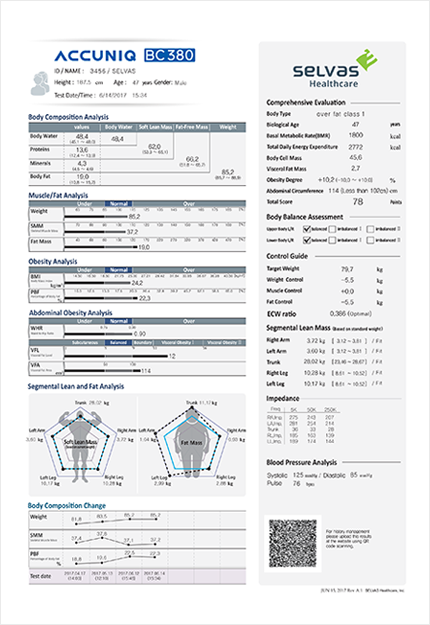 ACCUNIQ MANAGER is a client health data management solution that captures and presents all body composition results with comparisons to healthy ranges for fast and easy assessment. ACCUNIQ App is a mobile service for the management of personal body composition data. You can scan the QR code of the body composition measurement result with a smart phone so clients can check the result anytime. You can use the USB Wi-Fi dongle, which is provided for easy use of the device, to connect to the Selvas Healthcare C/S division and receive remote service more conveniently when checking or repairing the device. Power Supply Voltage Input: 100-240VAC, 50/60Hz, 1.4-0.7A, Output: DC 12V, 5.0A, 60W MAX. Measurement Time Approx. 30 sec. This product is a medical diagnostic device. Read “Precautions” and “Usage Methods” carefully before use. Q . What is the procedure of installing the Data management program? An installation file is in a CD that is offered with the BCA device. Refer to the user's manual about the installation and instructions for use. Q . What are the optimal specifications of PC to operate Data management software? ① CPU: Pentium 4, 1000MHz or higher. In case of a higher version than Vista, Pentium 4, 2000MHZ or higher. ⑤ The capacity of hard disk: 100MB or more. In case of installing Microsoft SQL Express 2005/2012 Express, 2.5GB or more. Q . What is the service environment for QR code? All the mobile devices supporting QR code and 3G / Wi-Fi can be used. Q . How can I view the data after scanning QR code? Once a measuring process ends, QR code is presented on the result screen or result sheet. When the QR code is scanned by a mobile device, it automatically accesses the exclusive website. It is available to view the present and cumulative data and result sheets on the exclusive website. The measured data are saved in the exclusive server so users can search them on the exclusive website whenever they want. Q . What is the service environment for Bluetooth communication? The mobile devices which can support the Bluetooth function are available. Q . Where can the App be downloaded from? you can download the exclusive App in Appstore or homepage on your mobile device. Q . How can I view view the data with Bluetooth communication? After installing the App, users can transmit their information from their mobile devices to a BCA device. Afterwards, they can measure their body compositions and send the measured data to the App. Q . . is it possible to use QR code or Bluetooth on all the products? The exclusive PC program is basically provided with all products. QR code is displayed on the result screen and printed on the result sheet hence, users can use it on both. But, X-CONTACT 350 is only able to display the QR code on the result sheet which is printed by PC program. Also the basic Bluetooth communication is provided to all products except for X-CONTACT 350. Q . Is a mobile device provided? We do not offer any mobile devices. Choose and use a proper mobile device in accordance with the specifications and performances. Q . Is it possible to use the three communication systems above all together at the same time? It is possible to use them all together or separately at the same time. However, it is impossible to use the communication methods using PC and Bluetooth function at the same time. and scanning QR code together. Alternatively, Bluetooth communication method and QR code scanning or PC communication method and QR code scanning can be used simultaneously. Q . What are the strengths and weaknesses for each method? ▶ Strength : It is able to save and manage a large amount of data. ▶ Weakness : There is a limited range of movement. strength: ① once user scans the QR code which is presented on the result screen and result sheet with a mobile device, the data are transmitted to the exclusive server and the result can be checked through the server. ② The measured data are saved in the exclusive server, hence, users are able to access and view the data anytime. ③ In case of using a mobile device which has a big screen such as smart pad, users can view the result in the sheet form without printing an extra. ▶ Weakness : After a measurement, the data can be only checked by scanning with a mobile device. ▶ Strength: ① The measured data are directly transmitted to a mobile device after a measurement. ③ Users can send the measurement result to their specialists by email and have consultations with them about the result. 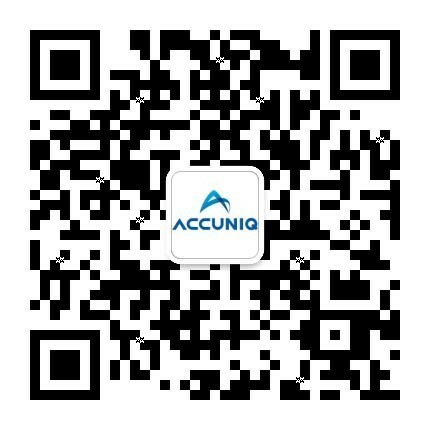 ▶ Weakness : ACCUNIQ's exclusive App can be limited for use depending on the type of the mobile device. Hence, users are advised to check the available device models before use. Shows the measurement results and normal range of total body water, protein, minerals and body fat which equal total body weight. Graph shows results for weight, skeletal muscle mass, and body fat mass compared to normal range. Graph shows body mass index and body fat percentage, compared to healthy range important indicators of obesity. The fat of the human body consists of subcutaneous fat and visceral fat. This analysis assesses visceral fat that are closely related to adult diseases by using various indicators. Graph shows muscle mass and fat mass of each of the five body parts (left arm, right arm, left leg, right leg, and torso). 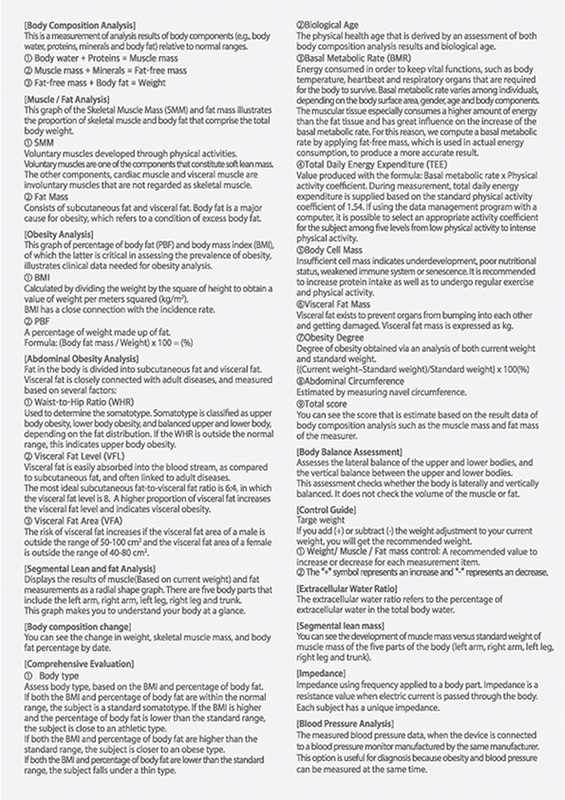 Historical graph of weight, skeletal muscle mass, and body fat mass, important indicators to assess progress. Shows body type, body age, basal metabolic rate, calories needed per day, body cell mass, visceral fat mass, degree of obesity. Assessement of the balance between the left and right of the body, and the upper and lower parts of the body. It evaluates whether the body maintains balance between the left and right of the body and the upper and lower parts of the body, rather than about the mass of skeletal muscle or fat. Extracellular water ratio indicates the ratio of extracellular body water to total body water. This index evaluates the body’s water balance and displays the body’s current state as normal, boundary, or abnormal. Muscle mass and status of the five body parts (left arm, right arm, left leg, right leg, torso) compared to the standard weight. Indicates impedance by frequencies and by body parts. Impedance is aresistance generated when electric current passes through the body. Each person has a unique impedance. Shows the blood pressure data when the device is connected to the hematomanometer provided by ACCUNIQ. This is especially useful because it assesses your obesity level and blood pressure at the same time.